Help guide your visitors through your website so they can find what they’re looking for. Every web design company begins their process in a different place. For us, we begin by identifying the goal: what do our clients want to achieve with their site, and how can we get them there? When we ask our clients this question, it can be a game-changer for how they view their website and its purpose. Suddenly, they’re no longer thinking about aesthetics, they’re focused on strategy. Now, appearances and brand recognition are important. In fact, they play a huge role in a lot of what’s to follow. But an attractive website that doesn’t put the users first won’t help the client achieve their goals. So, if you want to have a website with a user behavior flow that guides visitors in the right direction, here’s where to start. 1. Different personas will follow different user paths. First of all, there’s rarely one user path you want visitors to follow. Most businesses have several different customer types that shop with them, which we generalize as “personas.” You will want to identify your primary personas, and use your home page to guide each persona to the area of the site that fits their needs. Once your visitors are off the home page, subsequent pages can be optimized even further for their target personas. For example, if you are a clothing outlet, you may have a men’s line and a women’s line. By splitting visitors into one or the other, you can more readily target that separately. 2. Use your calls-to-action wisely. Ever seen someone write a priority list with so many items no one knows where to start? The more priorities you have, the less each is worth. The same is true of CTAs: the more you have on a page, the more your visitor’s actions are split. 3. Cut down on distractions. CTAs are a distraction, but they’re not the only kind. A crowded design can make it harder for visitors to understand where they want to go. This means that carousels, banners, ads, and a surplus of images can all draw your visitor away from the path you want them to take. Instead, use white space and other elements of hierarchal design to direct visitor attention toward where it needs to be. Have you ever follows a trail of links one or two pages deep, only to reach a dead end? Don’t drop the ball like this. When you successfully encourage a visitor to click on a link, make sure they have somewhere to go next. Your visitors should never reach a page and have nothing to do. Similarly, make sure your navigation is always accessible. Don’t hide it behind a hamburger menu unless you’re on a mobile version of the site. And make it easy for users to go back a page if they end up in the wrong place. In this sense, your website is like a giant building: you don’t want a visitor to walk through a door only for it to lock behind them. When your visitors land on your website, there are several actions they can take to convert from visitors to leads. They might make a purchase, fill out a contact form, or sign up for a newsletter. However, it usually takes visitors a while to perform this action. They know what they’re supposed to do next, they just need convincing. This is where having a site full of deep content comes in handy. Rather than reading your service page and leaving, visitors can reach the end of this content and find more material for them to consume. Blog posts help with this, as do other forms of downloadable content. Cross linking to other pages on your site helps retain visitors until they’re ready to take that final action. Visitors can exit your website at any time, but you can also plan pages in such a way that these exits are a little more controlled. Say you want visitors to fill out a complicated form which will start your sales process. At the end, it’s likely they will leave, but you can also offer them a reason to come back. Use these moments to suggest another action—such as a subscription to your newsletter, or a download of some high-value content. That way, even once they leave, you have a way to reach them and draw them back. 7. Don’t box your users in. 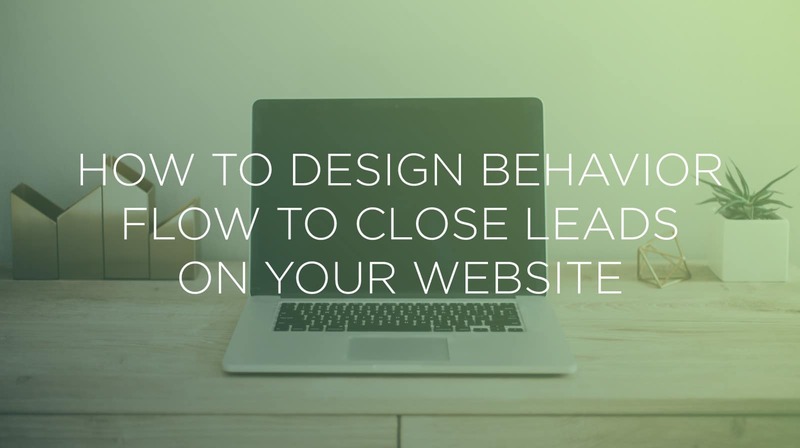 Finally, don’t go so overboard in designing your behavior flow that visitors can’t control their movements around your site. This is a huge point of frustration for many users, because it feels as though they are being restricted from engaging with the site and finding the information they need. Instead, while you should create a design that prompts users in one direction, you should never do so by limiting their behavior. Make sure they can still move freely through the site, except on sensitive pages (like checkout pages) where doing so might interrupt a transaction. Start with your most experienced prediction, then refine with data. One more thing: when designing a user behavior flow, your design and content strategy team will be drawing on interviews with you, your employees, and your customers. They will create a plan based on these conversations, as well as their own professional experience. However, every business is unique, and user behaviors are hard to predict. Therefore, you should never assume that your first design is the last. Instead, launch your website with your best possible design, then testing and tracking software to learn how your visitors interact with it. You will learn from this data how your users really travel through your site, and that information is what will help you perfect your Ann Arbor web design. Trust the data, and don’t be afraid to update if it shows you a better way.